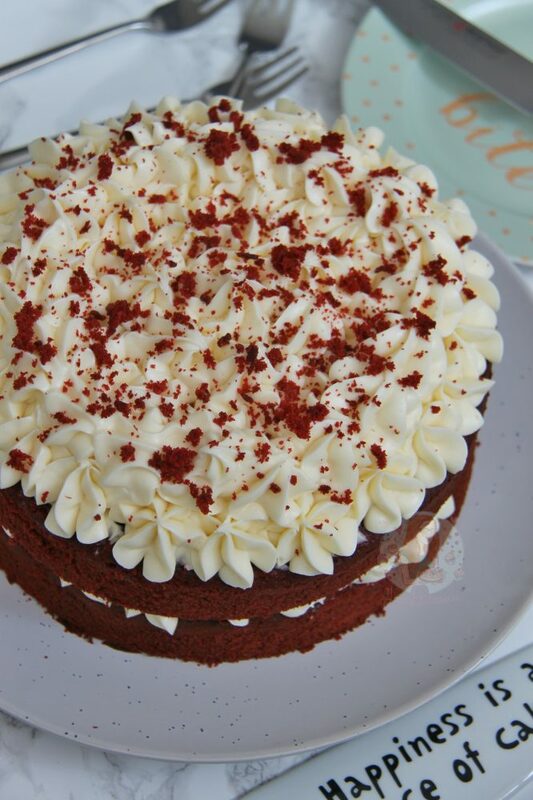 A delicious & light and moreish Red Velvet Cake smothered in Cream Cheese Frosting – Hello Cake Heaven! HAPPY 1ST BIRTHDAY TO MY BLOG – Jane’s Patisserie! Just want to say a MASSIVE thank you to everyone that supports my blog, likes my posts, comments on my posts, and especially to those who bake & share my recipes – I love you all!! 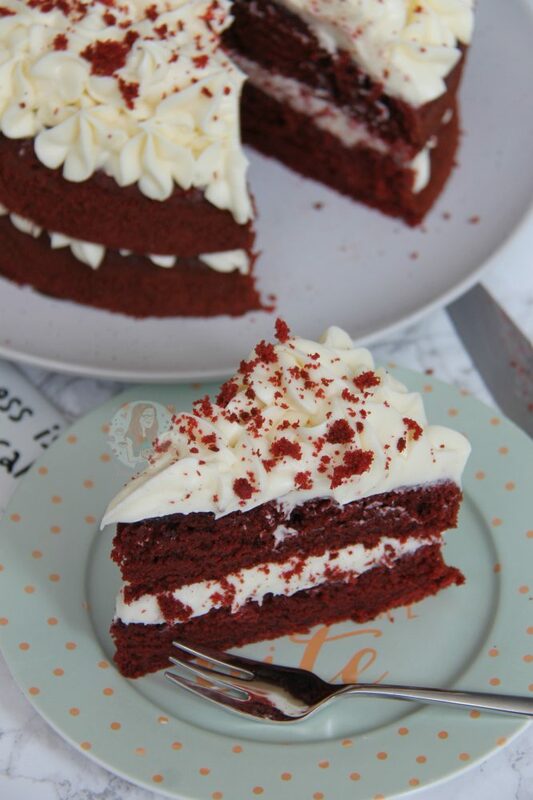 Red Velvet Cake is one of those ‘in things’ that all coffee shops will sell at some point, and the recipe that everyone wants to have and use, but its one of the most inconsistent cakes to make at home that I have come across! After trying out a few recipes from other websites and such I decided that developing my own was best – as some recipes were so unreliable I just didn’t feel comfortable! I would definitely say the key to the recipe is good quality food colouring – using the little liquid bottles you can buy from the supermarket, will NOT work! You will end up having to use about 5 bottle to make it work, and it’ll just taste manky – I use Sugarflair food colouring for all of my baking, and this is no different! I use the Sugarflair Red Extra Food Colouring you can buy, which comes in at about £5/£6 a pot, but it lasts for oodles amounts of time that this doesn’t matter! Also, the key of using the Buttermilk, Bicarbonate, and Vinegar means that the red colouring will be brought out even more, and you will get the classic Velvet Cake texture! I find the reason that peoples Red Velvet Cakes can fail is because of using lower quality food colouring, not mixing it with the cocoa powder (which is the ingredient that makes the colouring not work sometimes!!) and then not taking their time with the making of the cake. 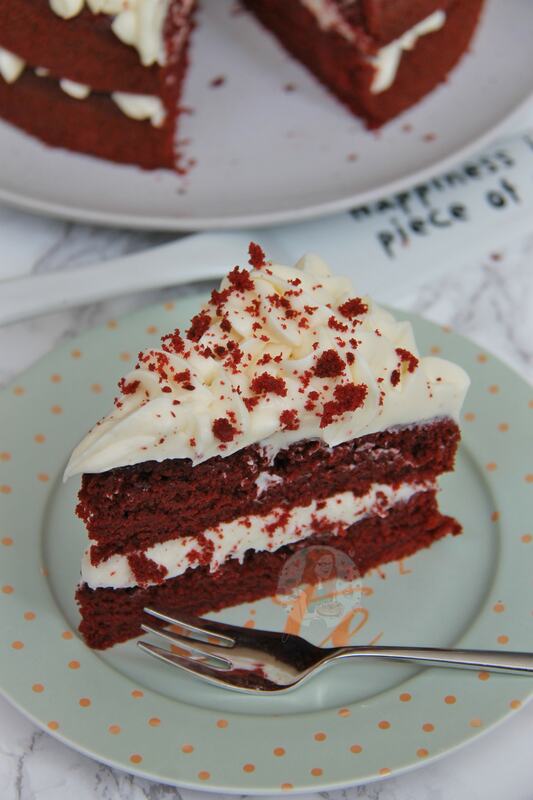 Gradually adding in all of the ingredients in the order specified makes a deliciously moist cake, that comes out super super SUPER bright red! The cake has a delicious mix of the flavours of Chocolate and Vanilla, which is utter heaven to me!! The Cream Cheese Frosting on top is sweet, delicious, and marries with the cake perfectly – but Cream Cheese Frosting can always be a liiiitle bit runny in comparison to others, thats its nature, however – as long as you don’t over beat it too much – it’ll be dandy and delicious! I love this cake so so so much, so I really hope you guys do too! For the Cream Cheese frosting, you have to make sure that your cream cheese has no extra excess liquid, and try not to over mix the mixture. Also, room temperature butter is important so there is no lumps. 1) To Bake the Red Velvet Cake – Preheat your oven to 170C/150CFan and Line two 8″ cake tins with butter and parchment paper – leave to the side for now. 3) In a small bowl, mix together the Cocoa Powder, Sugarflair Red Extra Food Colouring, and Vanilla Extract to a thick dark paste (if it is struggling to become a paste, then add in a little milk to make it runnier and mix better – it needs to be smooth!) – it may take a couple of minutes but this will make it easier to add to the rest of the mixture if you do it this way – and the sponge will be more red! 4) Add this mixture to the butter mixture and beat until combined and coloured well – turn the speed down so its slow, and pour in half of the buttermilk. Add in half of the flour and beat again, and then the other half of the buttermilk & beat, and then the other half of the flour & beat (I realise this is faffy, but it works!) Finally – beat in the Bicarbonate of soda, and vinegar. Beat again for a couple of minutes until everything is smooth and incorporated well – separate into the two tins and bake in the oven for 30-35 minutes until the middle of the cake comes out clean when poked with a skewer! 5) Once the cakes are baked, leave to cool on a wire rack. 6) To make the Cream Cheese Frosting – With a stand mixer/electric whisk, beat the room temperature/softened butter for a couple of minutes so its really smooth. Fold through the the cream cheese so its combined, or beat on a low speed. Stir in the Vanilla extract. 7) Gradually add in the Icing Sugar till its all combined – try not to beat too hard, you’ll want to do this bit by hand. I add usually about 500g, you want to add enough for it to be firm. 8) Even your cakes out by cutting the tops off (if they’re uneven in the first place) layer on 1/3 of the Frosting, smooth it over, and add the other one on top – and add 1/3 more frosting. 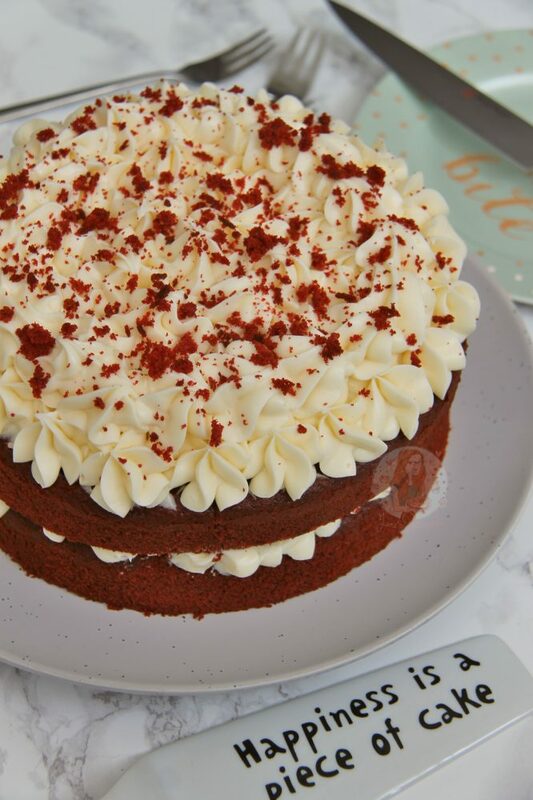 Finally, smooth the last 1/3 of frosting round the edges as well, and sprinkle on some cake crumbs to give the classic red velvet finish! I really really really recommend in investing in good quality Sugarflair Red Extra Food Colouring for a red velvet cake – I use Sugarflair paste colours which you can buy online, or in cake decorating shops etc – but they don’t have a funny taste to them, you use far less to make them work, and they last so much longer!! You really do need the butter in the frosting to be softened/at room temperature so that when you combine it with the cream cheese, it doesn’t take too long and it stays smooth. Cold butter will NOT work! This cake will last in the fridge for up to 3 days, covered! Older Next post: Caramel Apple Crumble Pie! Newer Previous post: Sugar Cookies! Hi Jane, amazing recipe! Family were huge fans when I made this. Have you ever tried to make red velvet brownies/cookies? I’ve had a look for a recipe online but it’s all cup/American measurements which never seem to work for me! Thanks!! It can do! But I do have a red velvet cupcake recipe already on my blog if that would be easier. I made this cake for hubby’s birthday today as he loves red velvet cakes. It tasted delicious, however I wish I had listened to you and bought the sugar flair red food colour as the cake wasn’t as red as I had hoped it would be (I used Dr Oetker extra red gel)! Love all your recipes!! Ahh I’m so glad it was enjoyed! And yeah, I only use colours from sugar flair or progel because they really are the only ones that work well enough! I bought the philadelphia tubs from the supermarket – if you’re concerned, you can squeeze out the excess liquid using a Muslin Cloth. Would this cake be sturdy enough to cover in sugarpaste? I’ve never personally tried – but if you’re filling with cream cheese frosting it must be kept in the fridge, and sugar paste shouldn’t be in the fridge. Can you buy Sugarflair colouring in any UK supermarkets or just online ? Thank you. Hi, just to let you know (and anyone else wondering) I went searching after I posted a comment and found a pack of 8 Sugarflair colours (including red) in Hobbycraft @ £15. A bit much for me so bought a Wilton Christmas Red from there instead . Will let you know how the cake turns out later! Verdict – sponge turned out perfect – moist and velvety. Icing – too sweet for our liking so will have to reduce sugar next time. a winner overall and will definitely make it again! thank you. 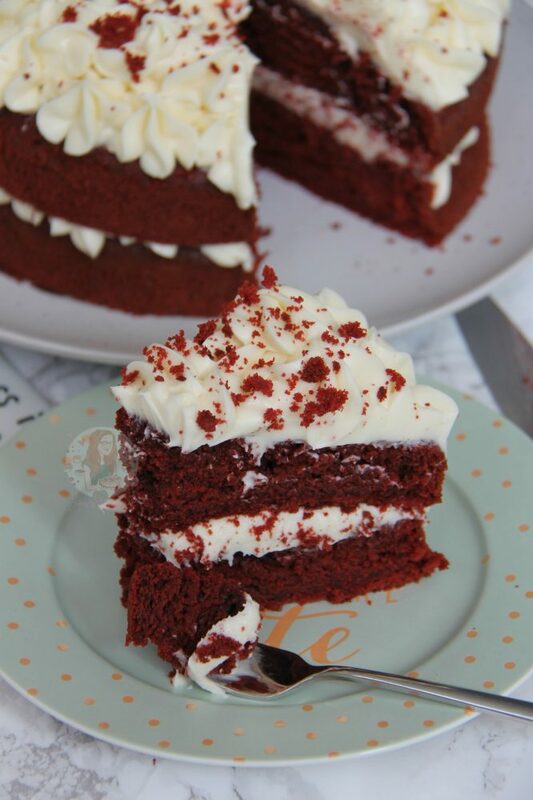 Just made your lovely red velvet cake. I stuck to the letter and it came out perfect…..and yes, defiantely use the good quality red colouring, I ordered sugar flair from Amazon and came next day . I was wondering why is it plain flour that one should use rather than self raising flour? Because a red velvet rises through the buttermilk, vinegar, etc. Self raising flour would be too much. I made this cake last week and its the first red velvet cake I’ve made that actually looks red!! It also tasted lovely but I did have some trouble with the cream cheese frosting (it still tasted lovely though!). It seemed quite runny which meant I had to keep the cake in the fridge. I was wondering whether I overdid it a bit when mixing? Any tips gratefully appreciated!! I agree about the frosting, mine looked more like melted milky bar! Next time I’m going to try less butter. You over mixed the frosting if it was loose – the butter helps firm it up. Hiya – If it was loose you over mixed the frosting. Its a common problem. Also, you need to keep the cake in the fridge anyway as it was cream cheese frosting. Hi Jane, love the blog so much! Was just wondering about the white vinegar in this recipe, is it white wine vinegar or can I use distilled malt vinegar? I’d use White Wine Vinegar 🙂 and thank you! I went on a hunt for white vinager but had no luck at asda…is it just called white vinager? I’d use white wine vinegar ? Thank you…looking forward to this one after reading all the great reviews ?? I have made this cake a couple of times now and it always comes up trumps. Everyone loves it. Thank you Jane for sharing the recipe. 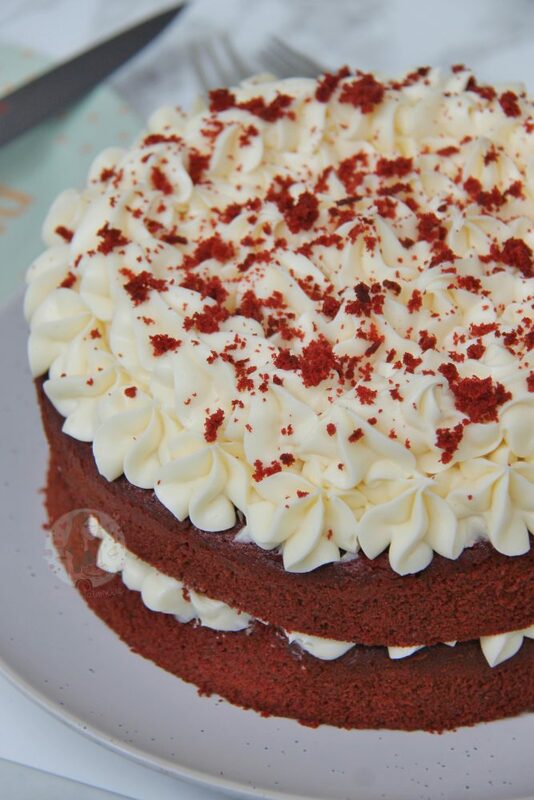 I’ve always been put off by the ingredients, but that has never kept me from enjoying red velvet cake! Yours is very pretty! What ingredients put you off? 🙂 and thank you! The vinegar reacts with the bicarbonate giving it the texture and bringing the colour out more I believe 🙂 but I get what you mean! Awwwwh thank you so so much!! 🙂 I really hope you like the cheesecakes – let me know how you get on!! Only a year? Wow, you’ve come so far!!! can this recipe be baked only for one cake? And not two baking trays? The baking time will be considerably different if you do it one, and you potentially risk it drying out, but I don’t see why not. Okay 🙂 and should I use self raising flour or just normal flour? Stick with plain flour like the recipe states – the self raising side of things might make it rise too much and then fall in the middle! Hehe thank you so much! Happy blogoversary, I do love a good red velvet cake. I have been disappointed with the recipes I have tried in the past. Your cake looks really perfect, next time I make one I will use your recipe. I do use good quality food coloring so I get that classic red color but am so glad you posted such detailed instructions. Thank you and Happy Birthday to your blog. Happy 1st Birthday to your fab blog. The cake looks delicious … i’ll be baking it for a friends birthday in a few weeks time. Thanks Mary! And Oooh perfect, I hope everyone likes it! Happy 1st birthday!!! That cake looks so delicious! Perfect way to celebrate ? I agree 😉 hehe thank you!! What a beautiful and delicious looking cake!! Happy blogoversary! Looks incredibly delicious, as usual!